Dodgy At Best: Lord Byron Is Dead. Long Live Lord Byron. Lord Byron Is Dead. Long Live Lord Byron. Plain and simple, one of the greatest golfers of all time and one of the kindest most gracious professional athletes ever in any sport. The Golf Channel website has an outstanding article about his life here. That and his Wikipedia article are must reads for anyone interested in his life. and then there's this dude in 1945. He was most famous for his amazing 1945 season where he won an incredible 11 PGA Tour events in a row and 18 in one season (out of 31 tournaments entered), both records that most likely will never be broken (Hogan won 6 in a row in 1948 and Woods won 6 straight in 1999-2000). He also finished 2nd 7 times that year and never finished out of the top 10. Throw in 1944 and Nelson won 31 of the 54 events he entered, batting a cool .574 against the field over a 2 year stretch. "When I was playing regularly, I had a goal. I could see the prize money going into the ranch, buying a tractor, or a cow. It gave me incentive." Amazing. Given his 10 year career that ended at 34, it is fair to say that if he played the Tour until age 50 like players in the modern era do, he would have the all time record for PGA Tour wins (82, Sam Snead) by a wide margin. Forget bling. Dude was ballin' for a tractor and a nice spread. Like many players from his era, he taught himself to play with secondhand hickory shafts after becoming a caddy. 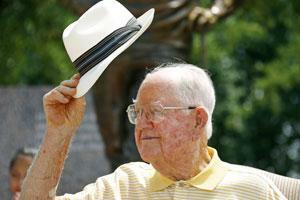 He won the first major he played in, the 1937 Masters, and won it again in 1942. The most famous bridge at Augusta National, which golfers cross to get to the 12th green, was named the Byron Nelson Bridge in 1958. It should be noted that the PGA Tour defines a "cut" as receiving a paycheck, even if an event has no cut per se. In Nelson's era, only the top 20 in a tournament received a check. In reality, Nelson's "113 consecutive cuts made" are representative of his unequalled 113 consecutive top 20 tournament finishes. Woods has only managed 21 consecutive top 20 finishes in his career. In 1968 he became the first player to have a PGA Tour event named after him, the Byron Nelson Classic, and he remains the only player ever so honored (although starting next year the Bay Hill Invitational will be renamed the Arnold Palmer Invitational). 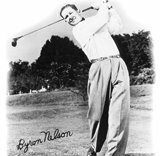 With the help of his personal involvement in the tournement, the Byron Nelson Classic has raised and donated more money to charity than any other event in the history of the PGA Tour- more than $94 million to date. He was personally involved and present at his tournament every year up to and including this year when he was 94 years old. 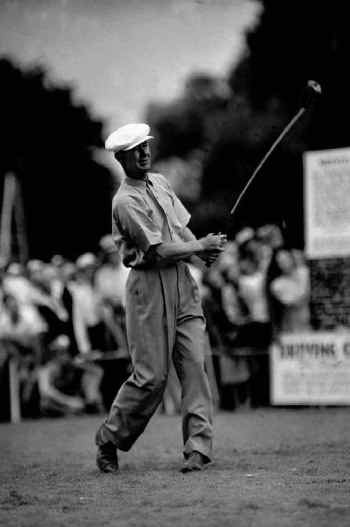 The USGA has long used a robotic swing arm to test clubs to ensure that they meet specifications; it has always been nicknamed the "Iron Byron" which tells you that his swing was as fundamentally sound as it gets. He is also considered by many in golf to be one of the greatest, if not the greatest, gentlemen in the history of the sport. quite possibly the greatest of all time.